For all intents it happened late last year, but today the results of an auction called it: THQ, formerly one of the biggest video game publishers in the world, is no more. While technically first formed in 1989 as Trinity Acquisition Corporation, THQ began business proper in 1990, as "Toy Head Quarters," only entering the video game business in September 1990 when it bought the video game arm of Brøderbund, a publisher famous for releasing the original Price of Persia. Its very first game was... Peter Pan and the Pirates, released in 1991. The gaming side of THQ was soon performing so well that in 1994 the company ditched toys (like figures and board games based on Home Alone) and dedicated itself wholly to releasing video games. Some of its more notable releases in these early years include certain Nintendo versions of games like Pit-Fighter and Road Rash. Unlike other competitors, who by the mid-90s were falling over themselves to release games for the new PlayStation, Saturn and N64 consoles, THQ made deals with developers to continue releasing titles on older platforms like the SNES, which resulted in massive profits for the company, as the costs of publishing on those systems was a fraction of what it was for newer consoles. In 1997, THQ released its first wrestling game with the WCW license, which was a massive success, and while it swiftly lost that license to rivals EA—foreshadowing similar battles to come over the UFC license—it made amends a few years later by going out and getting the rights to WWE games instead. Wrestling games would remain a staple of THQ's product lineup until the very end. As the millennium rolled around, THQ began to get a little more serious, expanding its business and either buying or opening a number of new studios like Volition, Relic, Vigil and Kaos. It had also signed big deals with Disney, MTV and Nickelodeon to release licensed titles based on their properties, and before long this would grow to be one of the most successful arm of THQ's business. And also one of the most precarious. With the addition of even more licenses, like Games Workshops' Warhammer 40K, it looked like THQ was well on its way to becoming one of the biggest publishers in the world, vindicated by the fact that in 2007 the company enjoyed its biggest year of sales (and profits) on record. Series like Dawn of War, Red Faction, Full Spectrum Warrior, Destroy All Humans and Saints Row were doing well, and a flood of big-selling kids games based on wrestling, Pixar's films and Spongebob Squarepants were printing money. By 2009, the bottom had fallen out of the licensed kid's market. Most of THQ's "core" games were reviewing well but not necessarily selling well. The global economic crisis had hit consumer's back pockets. Only two years after enjoying record sales, which at one stage had THQ threatening to rival traditional powerhouses EA and Activision, the company was forced to begin a process of consolidation and retreat that it was unable to halt. Despite pledges to focus on fewer but better games, and cuts to studios that weren't seen as performing, THQ continued to bleed money, with its biggest games—like new entries in the Saints Row and Dawn of War series, UFC fighting games and titles based on rapper 50 Cent—failing to recoup enough cash to stop the losses. In 2010, the publisher revealed the uDraw tablet, a multiplatform device designed to allow gamers to... draw on a screen. It was a disaster. It cost $100 million to design and manufacture, a significant amount for a company already in financial trouble, and sales were so poor they can't give the things away. By 2011, in no small part due to the losses suffered from the uDraw, the retreat was in full swing, with THQ backing away from licensed children's game development and pledging to focus solely on quality games for the core audience. A noble goal perhaps, but the games which followed—like the hugely-disappointing Homefront and Red Faction Armageddon—didn't deliver the sales THQ needed. That focus became even narrower a few months later, as by January 2012 only a core of the publisher's core games were being focused on, chiefly Saints Row, Darksiders, Company of Heroes, Metro and UFC. Red Faction was taken out back and shot. June 2012 saw THQ hand over their UFC license to rivals EA, a bitter move considering the battle between both companies over the rights and their previous history with wrestling titles. A month later, Devil's Third, a game being overseen by famed Japanese developer Tomonobu Itagaki, was offloaded, as THQ could no longer afford it, and a month after that, in August 2012, a project involving film director Guillermo del Toro was also cancelled. By now, THQ's big bet on core titles had come to nothing. November 2012 saw the publisher default on a loan which, despite a heroic attempt at raising extra cash in the form of a charity games bundle, would lead to a bankruptcy declaration. And the auction that played out this week, in which the company's studios and properties were picked over by rivals before THQ's bosses declared the end of the business. A sobering testament to the scale of THQ's demise: by January 2013, there had been twenty former THQ studios that had been either merged, sold or closed down between the late 90s and 2012. By the time of this week's sale, only Relic, Volition, Montreal and Vigil remained. 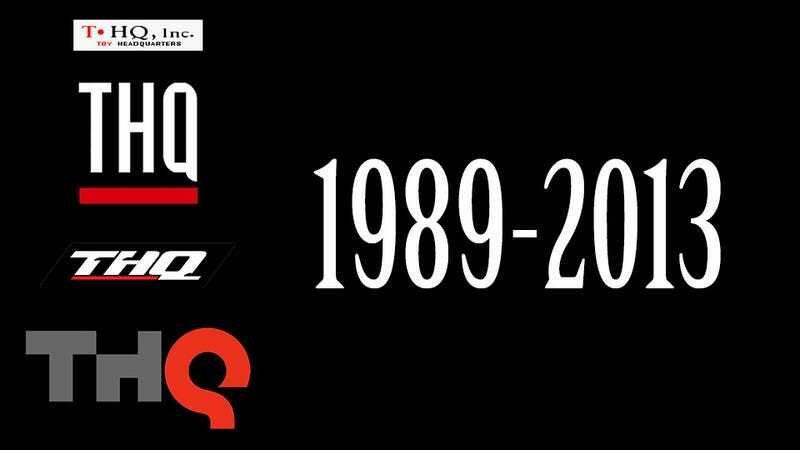 A few staffers are being kept on to oversee the dismantling of THQ and the transition of its studios to their new owners, but really, history will decree today as the day THQ died. It's a sad and ignominious end for a company that at one point challenged the industry's greats, but video games are a ruthless business that punishes those even half a step behind the times. Despite its best intentions in more recent years, the successive blows THQ received around 2009 were simply too great to overcome. Best of luck to all those affected by the closures and sales.